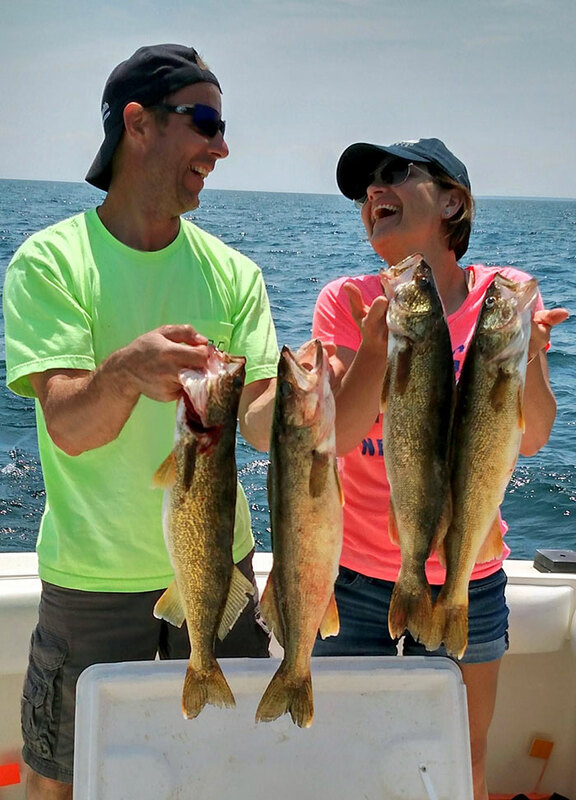 Lake Huron, Michigan: Weekly Fishing Report and more . . .
Lake Trout are being taken in the 60 to 120 foot of water areas North of the harbor. Try using plain spoons off the downriggers or the ghost dodgers with spin and glows down on the bottom. Best colors have been glow in the dark, white with pink dots, and black. Steelhead are being taken in 60 to 120 feet of water using 3, 5, 8, and 10 color lead lines off the boards, or try some spoons off the monofilament line with the Offshore tadpoles and put them off the boards. Lines off the downriggers back 50 and down 35 to 60 feet are also working. 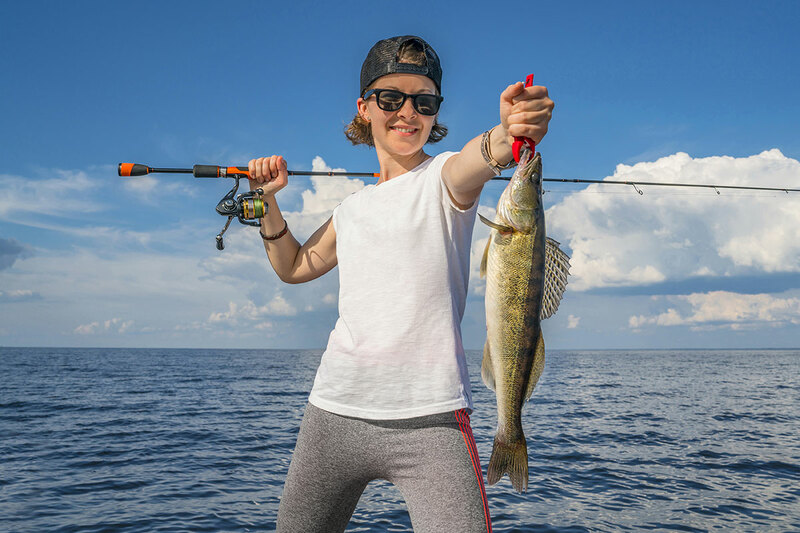 Bright colored small Pro King lures with orange, pink, yellow with silver, and red with green are working best. Walleye are being taken Straight out and North of the harbor on crawler harnesses, small spoons and small body baits. Try root beer, perch, purple, gold, and green with red colors. Five and ten color lead lines have been working well in the deeper water. I would also suggest using spoons and body baits trolled fast to cover more ground till you find where they are setting. Try starting in 30 foot of water and work out to as far as 100 feet of water till you see where they are. 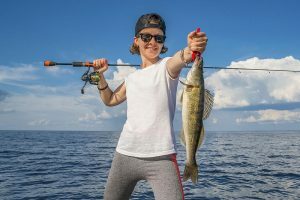 Salmon fishing is slow but some pinks and kings are being taken mixed in while fishing for the Lake Trout and Steelhead in the 100 to 140 foot of water areas North of the harbor. You might want to start trying some J-Plugs off the downriggers, dipsey divers, and boards also. 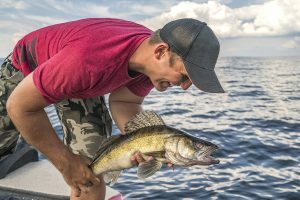 Perch fishing is slow, you might try South of the harbor by the cemetery in 25 to 50 feet of water with minnows. 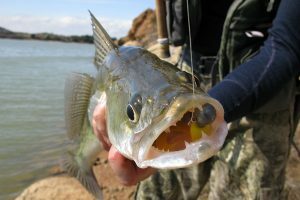 Bass and Pike are still being taken inside the harbor and close to shore casting small body baits and spoons.